We’re plugging along in The Fictive Dream workshop. Tomorrow will be our fourth week, and that will mark the halfway point. I’ve been enjoying things enough to keep working at a brisk clip, and that enjoyment is important in that there is no grade or tuition payments motivating me to get the most bang for my buck. The only downside is that I’m remembering how demanding grad school is, and this isn’t even grad school. While I’m sure what we are doing would pass muster in some creative writing programs, it’s still only about 50% of what we did in the official Northwestern workshops. That workload is plenty, and that’s fine–remember that this is free and we’re all volunteers. If too much is demanded of us, some would just walk away. I’ve been slowly plugging away at “Anthropology.” I got a few hours of work in on it last Friday, mostly focusing on the dialogue I had to create. I’ve got a lot more laid out in my journal, so it’s only a matter of giving the piece more time. The most I can hope for, I think, is to make it ready for whatever workshop may come next, whenever that may be. But it never hurts to have pieces laying around that you may or may not take further. Like I said last time, practicing is the most important thing. Plus, my pants are on fire with a few other pieces I’ve started since the workshop began, and I’ve been putting a good deal of effort into at least one of those. I have fiction ideas popping out of my head left and right. I’ve never before experienced that with fiction, which I think is a great sign that I’m feeling my own ability within the genre. One thing our workshop leader is having us do is to keep track of “glimmers,” or seed ideas for potential stories. This involves making record of odd bits of overheard conversation, thoughts or actions we witness throughout a day that stick with us, or striking images. The area is wide open, actually, so whatever you write down is whatever you write down (profound, huh? it is what it is…). This is actually a good idea for all types of writing, which reminds me to throw open my mind and keep my seed ideas on deck for whatever. My poetry would probably benefit from this every bit as much as my fiction writing has the last two weeks. But nothing new ever comes easy to me as a writer. I’m one of those “Act of Congress” writers; I don’t want to change my habits until things are completely hashed out in my head, so I wasn’t surprised at all I put myself through to adjust my writing habits to include the glimmers. It was mostly a matter of being able to do it quickly and easily (and thus disrupting my normal processes as little as possible). I always have a journal on me to write down and develop ideas (I usually have several, actually), but my mind doesn’t account for any way to whip out my journal and write down a short (2-3 sentence) glimmer before class, in line at the grocery store, or when I’m sitting in traffic. I wouldn’t do that in my regular journal because I would consider it a waste of paper, but I desperately wanted to try this suggestion. I ended up going to Office Max two weekends ago to find the tiniest journal I could; something that would fit into a jacket pocket or pants pocket. I have small journals, but they aren’t that small. I wanted something I could take whereever and, whenever needed, quickly whip it out. After twenty minutes of hem-hawing around in the notebook aisle, I walked to the register and plunked down my 87¢. No wisecracks about "size is everything," okay? I wanted to spend the least amount of money possible (check), it had to be something small (check), but also something that I could stuff a small pencil into and that wouldn’t fly open (no checks). I knew I would never find those exact things in any commercially available journal at Office Max, but that is why necessity is indeed the mother of invention. I went home, snipped a rubber band, and stapled the ends of it to the back cover of the dinky journal. 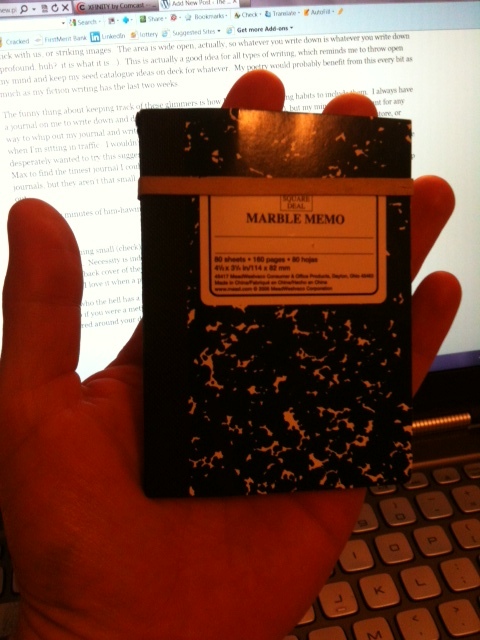 Now I have dinky, dirt-cheap journal that I can stuff a small pencil into it and it won’t fly open. I love it when a plan comes together. By the way… who the hell has a bunch of tiny pencils lying around that can be stuffed into jerry-rigged journals? I do. And you would too if you were a meticulous baseball scorecard keeper, and as such you have several seasons worth of scorecard pencils scattered around your desk that you refuse to throw out because who knows when you might need them some day? It’s a funny thing, writing–no? I was accepted into The Fictive Dream, a fiction writing workshop at Northwestern. An MFA student wanted to run a workshop to fulfill some graduation requirements, so the word went out and interested parties were encouraged to send a work sample and vow that they’d be available for the eight weeks the workshop would be meeting. Cool with me, I thought. It’s a chance to be back on campus, another chance to work on my fiction writing chops, and it wasn’t going to cost me anything but my time and effort. Plus maybe I’ll meet some more cool writers. There are eight of us total, plus the workshop director, who is a published Chicago fiction writer. Somebody had to sacrifice himself the first week of class, and I accepted. I threw out “Anthropology,” which is what I’ve been writing about in this serial (and that which I have been working on since last spring). The piece was definitely ready for workshop, and now it’s in that purgatory that exists for pieces you’ve sweated over quite a bit but that still need to be sweated over quite a bit. Overall, I need to expand the story. There are characters that need to appear, for one, but more importantly there are characters that need more screen time. Motivations are unclear, and can only be made clear by showing the characters in action. For me, this means dialogue. My characters have to speak more. The workshop coordinator has said several times that dialogue is the truest indicator, the best proof of what you need to show a character. I’m not sure I agree 100%, though I do agree that it’s very important. And I’m not surprised that I got that comment since I try to find ways around dialogue more often than not because creating it is one of my weaknesses. But when you workshop a piece, you lay it naked in front of everybody. They’re going to see the flab, the scars, the parts that you’ve neglected. So no surprise there. Working on some dialogue in two keys scenes in the story is also going to help me establish more conflict, which is another areas several writers found lacking, though I meant the piece to be more of a character study than anything and didn’t concern myself too much with conflict. Regardless, I’m not going to ignore the feedback. It’s all substantive and intended to help me craft the best piece possible. That’s why workshop exists. But how much time and effort do I want to put into this? As evidenced by this serial, I run hot and cold with the piece. The problem with that is that if I start running cold with it, then I might lost all the insights I have flying around in my head right now, or other things that might strengthen the story and stitch up a number of loose ends. I see all kinds of things happening with the story right now, things that can build it into so much more. But do I want to make all that effort? I’ve been flipping that question around since Saturday when I spent several hours going over all my workshop feedback and taking notes (in addition to all the notes I took during workshop). I suppose I’ll make all that effort and see what the hell happens. If the story grows wheels, it’ll go somewhere. If it doesn’t, then I’ll toss it on top of my Mount Everest of unfinished work and call it practice. Either way, I can’t really lose.